Built-In Focal Reducer, 0.71x Mag. Make full use of your existing Canon EF-mount lenses on your Micro Four Thirds mirrorless camera with this Pro Fusion Redux Smart AF Adapter from Fotodiox. Featuring FUSION technology, this intelligent adapter features electronic contacts that fully maintain autofocus, auto-exposure, and image stabilization capabilities as well as transfer Exif data and enable aperture adjustment from the camera body. Alternatively, an iris toggle switch is integrated, which can be used to adjust aperture settings via the adapter. This adapter further adds a micro-USB port to the design, which is used to update the adapter's firmware for future lens support and bug fixes. 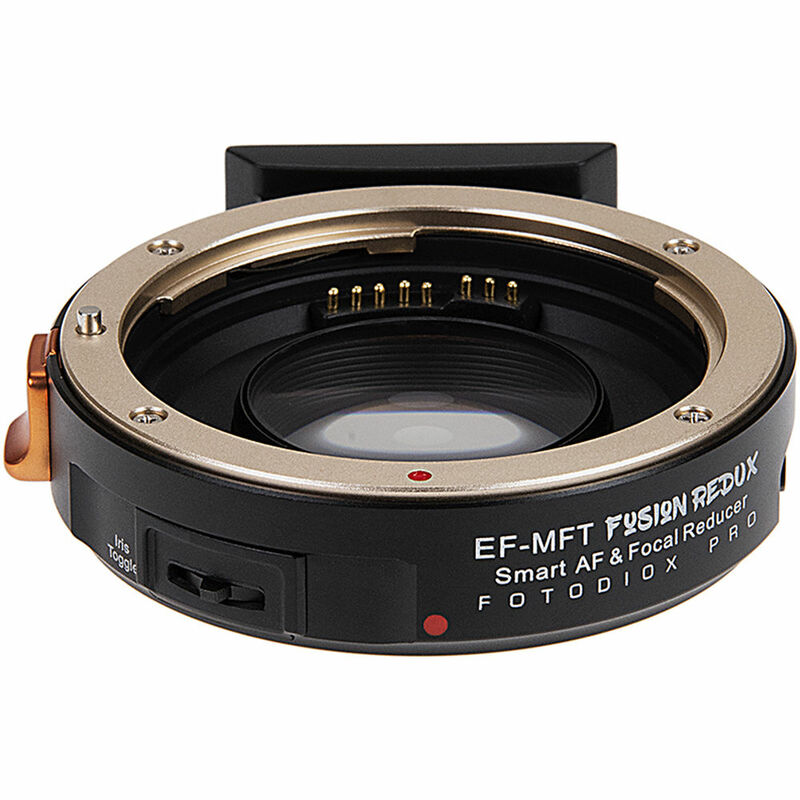 Complementing the electronic sophistication, this adapter is also characterized by its inclusion of a 0.71x-magnification focal reducer, which helps to offset much of the crop factor of Micro Four Thirds cameras while also concentrating the light in order to increase the effective aperture by one stop. Additionally, the adapter also features a durable chrome-plated brass construction and removable 1/4"-20 tripod mount to help support heavier lenses. Pro Fusion Redux Smart AF Adapter for Canon EF Lens to Micro Four Thirds Camera is rated 4.0 out of 5 by 3. Rated 4 out of 5 by Deanna from Looks good I have not used it but if you go the manufacturers site, it says this: Product Highlights: • Mounts Canon EOS (EF, NOT compatible with EF-S Lenses) D/SLR Lenses to Micro Four Thirds (MFT, M4/3) Mount Mirrorless Cameras; infinity focus or beyond guaranteed Not compatible with EF - S lenses so dont get your hopes up, BH should change this description. I've bought it, tried to use it with my BMPCC 4k with the latest firmware but it not communicates electronically to the lenses. I've tried to write to their support but haven't received any response. I'm using both lenses that are listed as supported in Fotodiox website (Canon EF 7-200mm/L f/4 IS USM and a Sigma 18-35mm f/1.8 ART Series. What happens: when you turn on the camera, ir reads right away the iris and 2 seconds later it blink off and you can't control at all the iris on the camera. Anyone tried or have a workaround? Does this fit the Canon Sigma 18-35mm f1.8 lens? As long as it is the EF mount lens it will fit. But, Fotodiox does not have it listed under their compatible lenses on their website. I have found that the lens does communicate with the adapter/camera so you can control aperture. But I did find that if I adjusted my focal length at all it threw off my focus (by a lot). But that might be fixed by adjusting the back focus on the adapter.